Open Enrollment 2018 > FirstFleet, Inc.
It’s almost over! 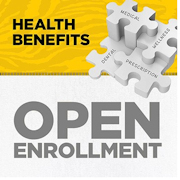 Open enrollment ends this Wednesday, October 31st at 8:00pm EST. Open enrollment is passive again this year. This means that you don’t have to enroll unless you are making changes to your elections, electing a 2018 Flexible Spending Account, or opting out of coverage. Don’t forget, Open Enrollment is your one opportunity each year (outside a status life change) to make changes to your existing coverage. Open Enrollment Guides have been mailed out to those that did not elect electronic delivery of benefit information this year. To view Open Enrollment information and make changes online, simply go to www.firstfleetinc.com/openenrollment or call (866) 824-2534 to speak with an enrollment specialist. Have a great day & Be Safe!